When evaluating governance, risk management and compliance software alternatives, you need to take a critical look at the GRC marketplace to determine the best solution for your company. Many GRC software tools on the market today offer various modules, like ERM, Audit, Compliance, Vendor Management, Incident Management, etc., at varying costs. They also offer different installation options, support packages, and other resources. If your goal is to select the solution that meets your key requirements, and can grow with your program over time, then you need to evaluate your options in a way that makes sense for your company’s unique needs. 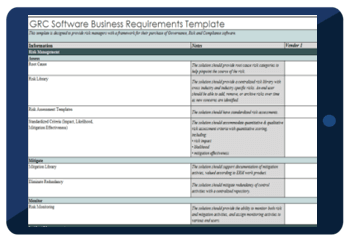 For an example of a business requirements template that you can adjust to fit the needs of your own evaluation, fill out the form to the right and download your copy of our customizable GRC software RFP template for Excel.